"Hostinger" Reviews (Apr 2019) - Why 4.8 Stars? A champion of affordable hosting, Hostinger is a popular pick for site owners looking for beginner-friendly shared servers. More than 29 million customers call Hostinger home as they scale websites through site builder, VPS, and WordPress hosting plans. When searching for a new plan, Hostinger is among the best at balancing high quality with low prices. 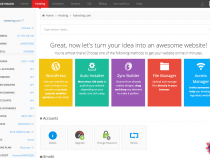 “Behind a mission to make life easier for website developers and their customers, Hostinger provides fast, stable, and streamlined services at a price that is very hard to beat. “As the shared hosting market becomes increasingly saturated, unlimited storage, bandwidth, and email accounts have become surprisingly average. Hostinger, however, extends the routine, expected metrics to greater lengths — the number of websites, databases, FTP users, subdomains, and parked domains are all unrestricted for most customers. Laura Bernheim (HostingAdvice.com): This rating is not available yet. We haven't evaluated Hostinger for the "Dedicated" option yet as they do not currently offer this type of hosting service. We're always working to keep our reviews up-to-date so check back later! Does Hostinger already offer the "Dedicated" option? Let us know. “Hostinger's laser focus on providing affordable hosting solutions shines brightest with the company's VPS packages. The company provides six different virtual server plans, including one that costs less than $5. Regardless of which plan customers choose, both site owners and visitors will enjoy the all-SSD infrastructure that loads pages up to 30 times faster than many shared hosting services. “As much as we love WordPress, one of our biggest pet peeves is when hosting providers exploit the popularity of the world's most-used content management system by offering so-called WordPress hosting that, in reality, is exactly the same as the host's shared server plans. Fortunately, Hostinger's ultra-fast infrastructure and easy access to SSL certificates and backups sets up the company to outperform the vast majority of the violators of our admittedly made-up rule. “Whether you're making your first foray into website hosting or are a developer looking to save some time, a strong website builder can dramatically streamline the creation process and enable users to launch a website in five minutes or less. 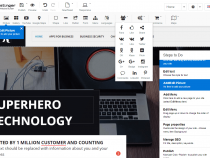 Fortunately for customers, Hostinger has invested heavily in crafting an impressive visual editor sure to appeal to users of all levels of experience. Even though one domain name registration is provided for free to those who sign up for annual Premium or Business shared hosting plans, Hostinger makes additional registrations ultra-affordable. Domains with the .com and .net extensions cost less than $10 per year, while .org and .biz domains are roughly $12 per year. Customers of the two higher shared hosting services can enjoy unlimited subdomains and parked domains, making it easy to build a robust portfolio of web properties. Hostinger makes transferring already purchased domains into your new account exceedingly easy through the ultra-intuitive control panel. For a small fee, you can be migrated to Hostinger's nameservers in an afternoon. 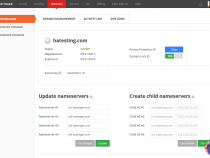 Hostinger's sleek, modern interface empowers users to manage all aspects of their hosting and domain subscriptions — no more keeping track of separate logins for updating your billing information, registering or renewing a domain, or even spinning up a new virtual server. The administrative interface's design is vaguely reminiscent of industry-standard cPanel and its Paper Lantern theme, but we appreciate the enhanced organization and larger icons that Hostinger provides with its panel. Throughout the portal, an ever-present icon exists to direct users to the most relevant knowledgebase resources. Support is easily accessible through how-to guides, live chat, and an online ticketing system. Customers who sign up for either of the top two shared hosting plans enjoy unlimited email accounts, included free of charge. Site owners can manage accounts and access webmail and other email features from the control panel. Email functionality includes the ability to set email forwarding and autoresponders, as well as editing mail exchanger records. Administrators can enable or disable their account's Sendmail, POP3/IMAP, or SMTP services. One of the most interesting email features Hostinger provides is the ability to forward all emails sent to a customer's domain, regardless of whether the email account exists. Catch-all emails take care of misspelled addresses and make sure users don't miss a single message. The quality and responsiveness of hosting support teams often suffers when companies scale to a global size and client base, but not Hostinger. We found its live chat agents to be responsive, knowledgeable, and quite helpful. Hostinger's repository of tutorials runs the gamut from basic instructions for helping beginners start a blog on WordPress, to helping experienced developers configure Docker and use the WordPress API. Customers can find even more information in the company's well-organized knowledgebase or through submitting an online ticket. With Hostinger employees spread around the world, someone is always awake and ready to answer your question. Not so with Hostinger. The company has created our favorite management interface that puts all the hosting services in a single accessible, intuitive package. Although cPanel is typically considered the gold standard, we didn't miss it at all when testing our Hostinger services. As much as Hostinger touts affordability, the bulk of the company's shared hosting plans are actually right in range with several of our favorite value-oriented hosts that use solid-state drives. The lowest-tier plan is certainly a noteworthy bargain, but we found the limitations on computing power too restrictive — especially when an additional investment of less than $1.50 per month unlocks boundless resources and several performance upgrades. We're actually more impressed with Hostinger's VPS pricing, which consistently comes in about $5 per month less than that of competitors. Although other companies might include more managed services, Hostinger's control panel and responsive support teams, coupled with SSD architecture, make the company's virtual servers increasingly appealing to experienced and budget-driven website administrators. Hostinger checks off the reliability and stability required of reputable hosts by offering the industry-standard 99.9% service uptime guarantee. If the company fails to maintain that level of service, customers can request a 5% credit of their monthly hosting fee. Given that the company has invested heavily in above-average hardware and solid-state drives, we don't expect many users to encounter this. The company's virtual servers are built on a cloud network, ensuring prime availability and always-on websites. Although the company does not include an option for phone support, we were impressed with how accessible Hostinger makes its support team. Each page of the control panel features a widget in the bottom right corner that, when expanded, automatically provides links to relevant articles from the knowledgebase depending on what page you're viewing. If you don't find your answer there, the company provides a button to open a live chat session or submit an online ticket. Wondering how Hostinger stacks up againt other web hosting services? See our host-vs-host reviews below and compare them side by side. Even though more than 29 million people around the world trust Hostinger to provide reliable and high-performing services and support, the company doesn't carry quite the same name recognition as other mainstream and U.S.-based hosting providers. Nonetheless, the Lithuanian-headquartered host provides around-the-clock support, SSD-powered hosting, and cheap domain name registrations on par with the best in the business. Combined with the company's truly stellar control panel, we wholeheartedly recommend Hostinger to prospective customers looking for a choice off the beaten path.